Cupcake wrappers are a lovely way to add some colour and magic to your child’s birthday party, tea party, Christmas party, Halloween party, or just about any other party you can think of! 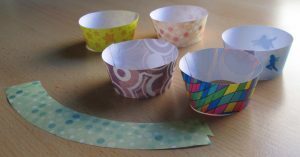 Home-crafted wrappers for cupcakes are becoming more and more popular as parents strive to give their children’s party food that special, homemade look. They’re lots of fun for ardent crafters and because they’re nice and easy to put together, for anyone looking for some crafting fun to do with the kids. It’s amazing how much they brighten up a party table and they’re all free, so why not give them a try? Looking for more kitchen crafting ideas? You might also like our pantry labels.